Scenery | Real Art Is Better! Part of my duties as the Vice President of the McCarthy – Kennicott Historical Museum is to volunteer for a couple hours a week at the museum. So, over the years, I’ve spent quite a bit of time in that building, looking at artifacts and at black and white photos from the late 1890s – early 1900s. One day I decided to make an oil painting from two black and white train photos that I saw at the museum. As anyone can tell by looking at my paintings, I like to use bright colors, so I went to work trying to recreate the photos in color. There was no way for me to know what color things should be, but being in the same setting where many of these photos were taken, gave me a pretty good idea. Recently, the museum asked me to design a new sticker, so I looked through many photographs of the Kennicott mining town back in its hayday, and put together the painting below that I named First “Lode”. This depicts the first train load of copper pulling out of Kennicott, on its way down to Cordova and onto a steamship headed to Tacoma. I worked from several different black and white photos to put together this scene. Seeing today’s ruins of Kennicott was very helpful in helping me decide what colors things should be. In the future, I plan to make several more paintings like this based on those photos hanging at the museum. Creating large, colorful oil paintings from small black and white photographs highlights those historical moments, bringing more attention to them. In any case, I’ve stumbled onto an interesting new genre that I’ll be experimenting with. Here’s one example of a train oil painting that I did based on a black and white photo. Prints of this painting are for sale at my Etsy shop. Another example of a train painting. Prints of this painting are for sale at my Etsy shop. And this is the latest piece that I painted from a combination of photographs and my imagination called First “Lode”. Prints of this painting are for sale at my Etsy shop. This entry was posted in Alaska Landscapes, National Parks, Scenery and tagged copper mine, Kennicott Alaska, painting from black and white photographs, train steam engines on June 6, 2017 by realartisbetter. PFD Sale on Custom Oil Paintings! Everyone is having a PFD sale this time of year, and I’m looking forward to seeing what Alaska Airlines will offer for fares to Hawaii. So I decided to have my own PFD sale! I’m offering a 10% discount on custom oil paintings. The offer expires on October 21st. So look through your photos from your summer adventures, and send me the one that you’d like me to turn into an oil painting. Think of where you’ll hang it, and that will help you decide on the size. My prices start at $150, which includes a frame with hanging hardware installed. You can contact me via e-mail at info@realartisbetter.com. I’ll post some of my favorite paintings from this promotion on Facebook and Instagram. Keep your PFD dollars in Alaska by spending on local goods and services! This entry was posted in Scenery and tagged Alaska pfd amount, custom painting, pfd sale, scott clendaniel on September 21, 2015 by realartisbetter. Yellow Schwinn Tandem Bicycle. Oil on panel, 24″x12″. Yesterday I finished another oil painting of a tandem bicycle. I’ve lost track of how many tandem bike paintings I’ve done, but I think it’s around ten. They are very special to me, because I think my green 1964 Schwinn tandem helped me get a girlfriend, who is now my wife. When I graduated from high school, my grandmother sent me a nice graduation present, and the cash was burning a hole in my pocket. One day I was walking down Spenard Road and saw a beautiful green Schwinn tandem parked next to a house. So I knocked on the door and a man answered. I asked him if the bike was for sale, but he said no, and slammed the door in my face. A couple weeks later, I saw the bike, and decided to ask again. This time a woman answered the door. I asked her if she’d sell me the bike, and she said yes! I can’t remember exactly how much money I gave her, but it was not much, considering how valuable that bike has been. So I was riding it around with my pals, until a friend told me to find a girl who would ride the tandem with me, because he didn’t think I was sending the right message to the ladies by riding that bike around with guys all the time. So one night, my friends came over to watch a movie, and one of them started looking through my high school year book, and saw that one girl had written a really nice message along with her phone number. So he told me I’d be stupid not to call her. I went upstairs right away and called her, and asked if she would like to go for a tandem bike ride. She said she had always wanted to ride a tandem! So we set up a date, and I came to get her on the tandem, riding solo. We went for a nice long ride to the beach, and I smooched her there, and then let her drive the tandem on the ride back. Apparently, that sealed the deal, because we got married five years later. Six years ago we bought a new Cannondale tandem, and we rode it all the way from Canada to Mexico along the Pacific Coast. It was one of the best experiences of our lives! We still have that green Schwinn, and we still take it out on short trips. We’ll probably never get rid of it. So that’s why I paint so many tandem bicycles. They are just way too special! Contact me if you’d like me to paint your tandem bike, or any bike for that matter. Paintings and prints of tandem bicycles are for sale at my Etsy shop. This entry was posted in Scenery and tagged anniversary tandem bike gifts, bicycle art, bicycle built for two, scott clendaniel, tandem bicycle art, tandem bicycle paintings, wedding tandem bike gifts on April 22, 2015 by realartisbetter. Here we are celebrating another colossal sporting event, one so important that we stop everything we are doing and crowd around the TV for over three hours. If you are not into football, the commercials and snacks are worth your time, not to mention the halftime show! I was in Sun Valley, Idaho the day after the Seahawks won the conference game. I was surprised to see a very shiny Porsche Turbo in the parking lot decked out with Seahawks colors and the 12th Man logo! I took photos of it, because I like painting cars, and when I got back to Anchorage, I searched for this car on the Internet and found out that it belongs to Seahawks fan J. DeBruler. He owns Accutint Bellevue, a company that tints windows and customizes and details high-end car finishes. So he dressed his $80,000 turbo Porsche out in the 12th Man digs. He wins as the biggest Hawks fan I’ve ever heard of. He plans to drive the car to several rival stadiums and take photos of it there. I painted it right in CenturyLink Field. For all you Patriots fans, if you have a sweet red, white, and blue auto you want to bring to my attention, I will paint it too! I’m an equal opportunity sports fan, although, I think there will be a 90% Hawks crowd at the party I am attending later today… We don’t have a football team in Alaska, and Washington is the closest state (I was also born there). Cheers to the 12th Man, and may the best team win! 12th Man, Seattle Seahawks Porsche. 8″x10″, oil on panel. This entry was posted in Scenery and tagged 12th man fan art, 12th man seahawks porsche, art for man cave, centurylink field painting, gift for him, gift for seattle seahawks fan, seattle seahawks art, seattle seahawks fan art on February 1, 2015 by realartisbetter. This painting is of a saguaro cactus that lives in the front yard of Rita and Jack’s house in Phoenix, Arizona. After working on South-West art for Arctic Circle Enterprises, it was a joy to do some fine art that exemplified the South-West theme. I love the desert, especially in the winter. It was a joy to go out golfing after painting this painting and feel the extreme warmth on the day before Thanksgiving. I hope all of you have as much to be thankful for this year. I know I am very thankful for my life and for the successful end of this leg of my tandem trip. I think that life is good and hope yours is going as well as mine! This entry was posted in Scenery and tagged arizona desert painting, plein air painting, saguaro cactus painting, scott clendaniel on November 26, 2009 by realartisbetter. Saint Andrew’s Episcopal School, landmark and icon of the San Jose Area. This Oak Tree is a great example of old growth oak trees in the San Jose Valley. This painting will be up for auction at a fundraiser November 14th. Since everyone loves this tree it should make for a pretty cool item at the auction. I had mixed up a new palette of paint, and I feel that it made for a fairly strong painting because of that fact. I love working on the acrylic sheeting (Plexiglass-Lucite) because It allows the transparency to show and I can look backwards into the history of the layering. It also has this nice reflective aura due to the coating on the sheets. Best of luck, and happy bidding, if you are in the Bay Area stop by St. Andrew’s for the Auction! 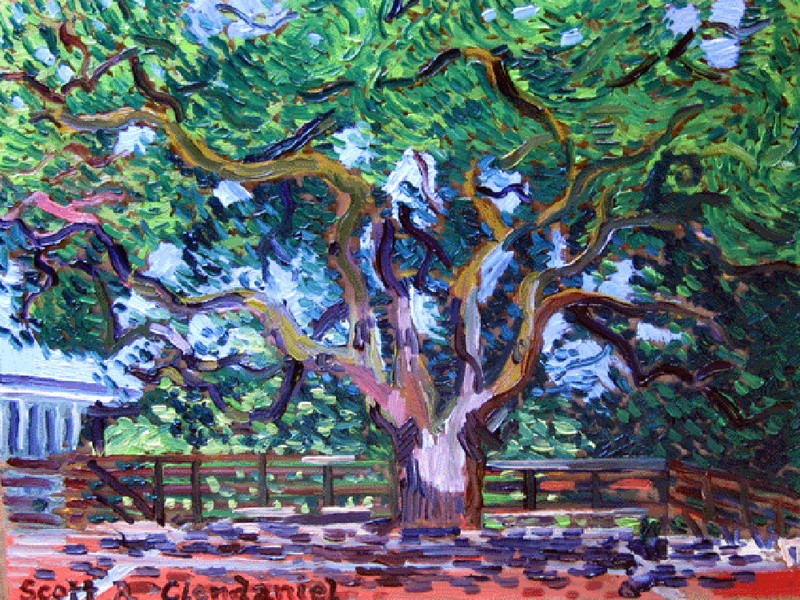 This entry was posted in Scenery and tagged oak tree painting, plein air painting, San Francisco Bay Area, san jose california painting, scott clendaniel on November 1, 2009 by realartisbetter.